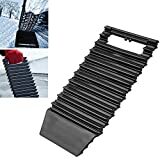 Instead of spinning your tires and yelling or calling a costly tow truck when your vehicle gets stuck in the snow, mud, or sand, try slipping these cool new Portable Tow Truck - Emergency Tire Traction Mats under the pulling wheels to give them something to bite down into and pull free. 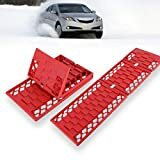 This set of two lightweight, yet nearly indestructible tire traction mats have angled and straight cleats on top to give the tire needed traction and deeper angled cleats on the bottom to dig down into the snow, mud, sand, or ice as you drive out onto a safer, less slippery surface. If you live in a snowy climate, these helpful mats should be an indispensable part of your vehicle's winter emergency supplies for a little extra peace-of-mind, especially when traveling in treacherous conditions. A floor mat could also be used in a pinch, but why ruin one if you don't have to? Check out this video to see them in action.